Split into groups of at least four members. Start by exploring the idea of religious freedom by studying the Declaration of Independence, the Bill of Rights and The Constitution and then write a short essay on your understanding of religious freedom from these historical documents. 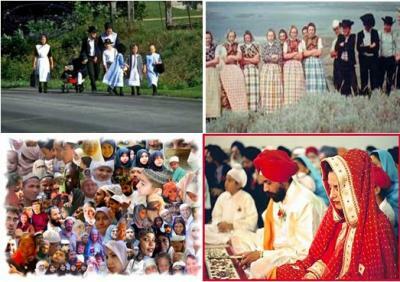 Each member of the group needs to select one of the four religious groups to explore: (1) Amish, (2) Hutterites, (3) Islam and (4) Sikh. Research the group you chose. You may use but are not limited to the links provided here. Thoroughly research their lifestyle and religion making sure to supply a brief history of the origin of each group. Your research should be compiled in a report (with a minimum of 500 words) on the religious beliefs and lifestyle of the group you have selected. Compile the four essays and the original essay from step one and put together the final report complete with your opinion of whether these groups enjoy religious freedom or not and why. Put together a PowerPoint presentation explaining your findings with graphics and/or photos to share with the class. Make sure your presentation includes a reference page showing the sources for your materials both written and graphic.